Bangladesh is located in the tropics in South Asia and has a total area of 147,570 sq. km, which is about three times the size of Denmark. It shares its borders with India on the west, north, and Myanmar (Burma) on the east. On the south, 66,400 kilometers of coastline merge into the Bay of Bengal. 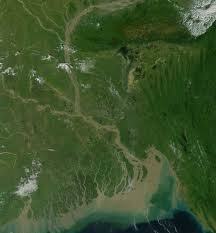 Bangladesh is a part of the Bengal basin, which is one of the most seismically active zones of the world. However, no major earthquake has occurred in Bangladesh since 1950.1 topographically, the country is almost entirely a fertile alluvial plain formed by the two main rivers, the Ganges and the Brahmaputra and their hundreds of tributaries. Hills rise above the plain only in the Chittagong Hill Tracts in the far southeast and the Sylhet division in the northeast. The world’s largest littoral mangrove belt, The Sundarbans, covers an area of nearly 3600 sq km in the southwestern part of Bangladesh and another 2400 sq km in east India. About 10 % of Bangladesh is still forested. Half of the forest is in the Chittagong Hill Tracts, a quarter in the Sundarbans, and the rest scattered in small pockets throughout the country. The country is divided in the following seven divisions: Rajshahi, Sylhet, Chittagong, Khulna, Dhaka, Barisal and Rangpur Division, all named after their respective capitals. The capital city, Dhaka, with over 10 million citizens (2001) is located in the central part of the country. The area that is now Bangladesh has a rich historical and cultural past, combining Dravidian, Indo-Aryan, Mongol/Mughul, Arab, Persian, Turkic, and West European cultures. Residents of Bangladesh, about 98% of who are ethnic Bengali and speak Bangla, are called Bangladeshis. Urdu speaking, non-Bengali Muslims of Indian origin, and various tribal groups, mostly in the Chittagong Hill Tracts, comprise the remainder. Most Bangladeshis (about 88%) are Muslims, but Hindus constitute a sizable (11%) minority. There also are a small number of Buddhists, Christians, and animists. English is spoken in urban areas and among the educated. The history of Bangladesh has been one of extremes, of turmoil and peace, prosperity and destitution. It has thrived under the glow of cultural splendor and suffered under the ravages of war. The earliest mention of Bangladesh is found in the Hindu epic, the Mahabharata (the story of Great Battle-9th century B.C). Evidence also suggests that there was a strong Mongoloid presence as well. Soon after, in the 5th and 6th centuries B.C. came the Aryans from Central Asia and the Dravidians from Western India. Then came the Guptas, Paals, Senas, who were Buddhist and Hindus. From the 13th century A.D., the flood of Muslim invaders and the tide of Islam up to l8th century swamped the Buddhist and Hindus. Sometimes there were independent rulers like the Hussain Shahi and Ilyas Shahi dynasties while at other times they ruled on behalf of the imperial seat of Delhi. From 15th century the Europeans, namely, Portuguese, Dutch, French and British traders exerted an economic influence over the region. British political rule over the region began in 1757 A.D. when the last Muslim ruler of Bengal was defeated at Palassey. After the end of the British rule In1947, the country was partitioned into India and Pakistan. Present Bangladesh became the Eastern Wing of the then Pakistan. However, the movement for autonomy for East Pakistan started within a couple of years because of linguistic and cultural difference and economic disparity between the two wings. The seeds of independence were sown through the Language Movement of 1952 to recognize Bangla as a state language. Ultimately then, the East Pakistan emerged as a sovereign and independent state of Bangladesh in 1971 after nine month-long the bloodiest war in modern history of Liberation (starting on 26 March 1971) under the leadership of the Father of the Nation, Bangabandhu Sheikh Mujibur Rahman. On December 16, 1971, Pakistani forces surrendered, and Bangladesh-meaning “Bengal nation”–was born; the new country became a parliamentary democracy under a 1972 constitution. The Bengal region has a multifaceted folk heritage, enriched by its ancient animist, Buddhist, Hindu, and Muslim roots. Weaving, pottery and terracotta sculpture are some of the earliest forms of artistic expression. The best-known literature of Bangladesh is the work of the great Bengali poets Rabindranath Tagore and Nazrul Islam. Folk theatre is common at the village level and usually takes place during harvest time or at Melas (village fairs). There are many folk dances, but classical dance is largely borrowed from Indian models and is frowned upon by the more severe religious leaders. Bangladesh’s Muslims and Hindus live in relative harmony. The Muslim majority has religious leaders, piers, whose status straddles the gap between that of a bishop and that of a sage. Hinduism in Bangladesh lacks the pomp and awe of the Indian version, but consequently Hindu ceremonies are rarely conducted in the depths of temples to which access is restricted. People here are very willing for you to watch and even participate. Buddhists today form only a tiny minority of the population. It is worth noting that the Bangladeshi pride in ancestry is balanced by the Islamic slant of the country’s intellectual life, which tends to deny the achievements of the preceding Hindu and Buddhist cultures. A typical Bangladeshi meal consists of beef (or sometimes mutton, chicken, fish or egg) and vegetables cooked in a hot spicy sauce with mustard oil, yellow watery lentils (dal) and plain rice. Fish is part of the staple diet; however, over-fishing has led to a scarcity of river fish and more sea fish are appearing on menus. Alcoholic drinks are not widely available; head for five-star hotels and ritzier restaurants when you want a tipple. The country is officially known as the People’s Republic of Bangladesh and has a Parliamentary form of Government. The President is the head of the state. The Prime Minister heads the Government. The country is divided into seven divisions (regions), namely; Dhaka, Chittagong, Rajshahi, Barisal, Sylhet, Khulna and Rangpur. There are 64 districts, 460 thanas (police station), and 85,650 villages under 7 divisions. Besides there are 38 thanas (Police station) that mostly fall in metropolitan cities or other urban areas. Bangladesh has a 330 seat Parliament called ‘Jatiya Sangsad’. Three hundred members are directly elected and the three hundred Members of the Parliament (MPs) elect the other thirty members reserved for women. Legislative power is exercised by the Parliament. Bangladesh has a tropical monsoon climate. There are four seasons in a year – winter (December – February), summer (March-May), Monsoon (June-September) and autumn (October-November). The temperature across the country ranges between 13.5°C and 26.5°C in winter months. Annual rainfall varies from 160 cm to 200 cm in the west, 200 cm to 400 cm in the southeast and 250 cm to 400 cm in the northeast. A major part of the coastline comprises a marshy jungle, the Sundarbans, the largest mangrove forest in the world and home to diverse flora and fauna, including the Royal Bengal Tiger. In 1997, this region was declared endangered. The Magpie Robin is the National Bird of Bangladesh and it is common and known as the Doyel or Doel (Bengali: দোয়েল). It is a widely used symbol in Bangladesh, appearing on currency notes and a landmark in the city of Dhaka is named as the Doyel Chatwar (meaning Doyel Square).The national flower of the country is water lily, which is known as Shapla. The national fruit is jackfruit (Artocarpus heterophyllus), which in Bengali is known as Kathal. In late 2010, the Bangladeshi government selected the Mango tree as the national tree. The educational system in Bangladesh is three-tiered and highly subsidized. The government of Bangladesh operates many schools in the primary, secondary, and higher secondary levels. It also subsidizes parts of the funding for many private schools. In the tertiary education sector, the government also funds more than 15 state universities through the University Grants Commission. Primary (from grades 1 to 5), Secondary (from grades 6 to 10), Higher Secondary (from grades 11 to 12) and tertiary. The five years of lower secondary education concludes with a Secondary School Certificate (SSC) Examination. Students who pass this examination proceed to two years of Higher Secondary or intermediate training, which culminate in a Higher Secondary Certificate (HSC) Examination. Education is mainly offered in Bangla, but English is also commonly taught and used. A large number of Muslim families send their children to attend part-time courses or even to pursue full-time religious education, which is imparted in Bangla and Arabic in madrasahs. Bangladesh has some thirty public and forty-five private universities. NationalUniversity has the largest enrollment amongst them and University of Dhaka (estd.1921) is the oldest university of the country. Bangladeshi universities are accredited by and affiliated with the University Grants Commission (UGC), a commission created according to the Presidential Order (P.O. No 10 of 1973) of the Government of the People’s Republic of Bangladesh.